Here's a visual update to my off-topic essay "Armchair Nostalgia" from two weeks ago, about my retro stereo project. The rebuilt receiver arrived, and I installed it in the minty (mmm) walnut case I found for it. Meanwhile I'd ordered and received a pair of Dynaco A-25 speakers in excellent but not mint condition; my brother Scott thinks these are what our brother Charlie used to have, although I haven't asked Char about it yet. He might well have: Dynaco reportedly sold as many as a million pairs of these. Considering that there have been something like 14,000 speaker manufacturers in history, that's a pretty remarkable achievement. I got the Dynacos from Ken Drescher at Audio.net. Check out the fabulous pair of Dahlquist DQM-9's he's got listed—that's what Scott has, and has always loved, although his are no longer working. A great speaker. 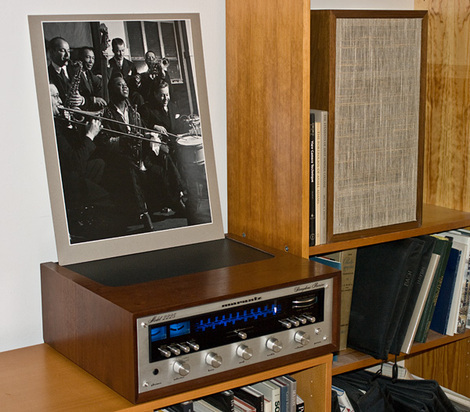 The photograph on the receiver is a 16x20" print made from an original Speed Graphic negative by Charles Peterson. Clockwise from center, it shows a then-38-year-old Louis Armstrong, Tommy Dorsey in profile on trombone, an unidentified sax player (I once knew, I just can't remember), "Pops" Foster on standing bass, Eddie Condon on guitar, Red Norvo on trumpet, and...augh, I've forgotten the drummer's name too. Anyway, the picture was taken backstage at a segregated Harlem nightclub in 1939. The white and black musicians weren't allowed to play together onstage, but after hours they'd get together and jam backstage. Charles Peterson no doubt asked them all to scrunch together so he could get everybody into the shot. 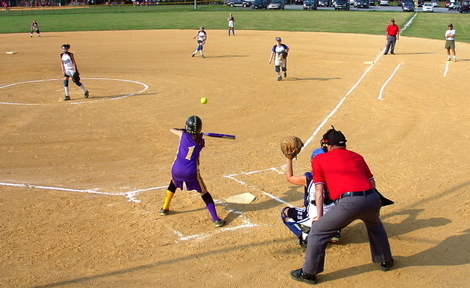 A father's snapshot of his 11-year-old daughter successfully executing a bunt in a girls' softball league, taken through the chain-link fence. Chambersburg, Pennsylvania, July 2008. "I hope you all happened to be watching the Angels-Red Sox game on Monday night when the Angels pulled off the small-ball fait accompli—a perfect suicide squeeze. It was beyond beautiful. 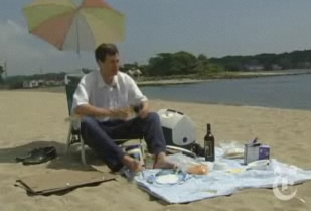 Featured Comment by Tom K.: "A wonderful slice of Summer and Baseball and Americana itself. I love baseball. I love this photo." I wonder, does everyone know why the magazines you see in airport newsstands are there? It doesn't happen by accident. Mostly, publishers are forced to pay a placement fee or "space contribution" to get their titles put out on sale at airports, especially in the newsstands inside the security checkpoints. That's why you see lots of big titles—and lots of magazines of the type that depend on newsstand sales for the lion's share of their circulation, such as fashion and womens' titles, and football, automobile, and sartorial titles for men. You won't see much in the way of smaller, poorer magazines for sale in airports—nor many produced by small independent publishers, either. That would include a fair number of hobbyist titles. But here's a new twist. Asda, a big U.K. supermarket chain, seems to be taking this peculiar form of extortion a bit further. Not only is Asda demanding that magazine distributors pay £10,000 per title to sell magazines in its stores—and not only does it want £2,500 additional per title, per store for new stores as they're built—but it's demanding that it receive two pages of free ad space in each of the magazines it stocks as well! That's a new one on me. I've heard of set-out fees, but I've never heard of venues actually taking over content. What's next? You will turn over all your profits to us, or your workers will starve. Buahahaha! Bastards. 1. Don't buy on the newsstand—subscribe. Why? Because most smaller titles don't make much money on newsstand sales, if any. You pay more, but more of it goes to the sharks, or is eaten up in costs. For some, newsstand sales might even be an expense—a net loss. 2. Subscribe for two years at a time. Why? Many magazines are set up such that their promotion and circulation efforts more or less eat up the first year's profits. Where they finally make money on is renewals. Renewals are subscribers they don't have to spend money to find. So make their day—give 'em a renewal right off the bat. 3. Send in your payment with your subscription. Why? Because billing and dunning costs are a big expense for most publications. Save them the hassle—send 'em a check. I know the common argument—people say they like to leaf through an issue to see if enough articles interest them before buying. Just try this simple little calculation: divide the cost of a year's subscription by the newsstand cover price. I recently subscribed to 12 issues of a favorite magazine for $10—and the newsstand cover price is $6.99. That means that if I buy more than one single issue every year (which I do), I'm better off subscribing. For most magazines your break-even number is somewhere between two and four issues. At that rate, it doesn't really matter if you're interested in two articles per issue, rather than five, in the eight to ten issues you're getting "for free" as it were. You're still ahead by subscribing. What's particularly tragic from a publisher's point of view is that some people deliberately buy their favorite magazines on the newsstand in the mistaken belief that, because they pay more, the magazine benefits more. Granted, there are some magazines—fat, glossy fashion mags, for instance—that do most of their business from the newsstand, and they don't really care if you subscribe. Not so for most smaller, struggling hobbyist titles. Oh, and another thing? Don't buy your magazines at the supermarket or the airport. How would you find out about them, then? Well, here's one last tip most people no longer know: most magazines are happy to send you a sample issue if you request it. It might not be the absolute latest issue, but it will be a recent one. Just write and ask. 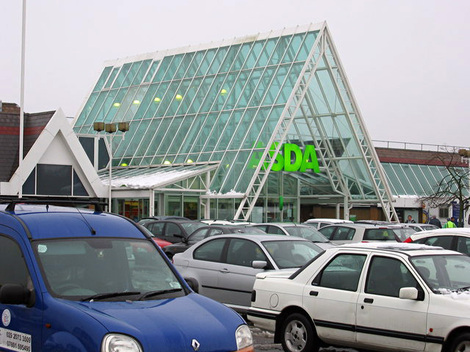 Featured Comment by Tony Boughen: "Mike, Asda may be a big UK supermarket chain, but it was taken over a few years ago and now advertises itself as 'Part of the Wal-Mart family.' So watch out, they might be trialling a form of corporate blood-sucking that will soon cross the pond!" Mike replies: Oh, so they really are bastards, then. My condolences for my country infecting you with this particular plague of modern life. Featured Comment by Thom Hogan: "A couple of things. First, Mike's viewpoint is from a smaller magazine viewpoint. Absolutely the small, independent magazines would prefer not to deal with newsstand circulation and all the issues that this brings up. "However, from a large circulation magazine's viewpoint (remember, I worked for a company that was putting out millions of units a month) things actually work a bit differently. That $10 you pay a year for a magazine? That's actually a worse thing for the magazine than selling 30% of the magazines they place on the newsstand at $6.99. It has to do with the way ABC audits work, amongst other things. Basically, a magazine guarantees eyeballs to an advertiser. How those eyeballs are valued is dependent upon a lot of things, and the average price paid is one of the key differentiators in the big leagues. For instance, my magazine maintained an over $20 average for 9 issues, while one of my competitors was averaging less than $14 for 12 issues. Guess how that impacted ad rates? "But newsstand sales do other things for magazines that are under-appreciated. One of the reasons I got the job at that company in the first place was that I could scan their covers and predict with a good deal of success how they'd do. Why is that important? Well, subscribers actually rarely give you feedback other than a blanket renew/no renew decision. Newsstand sales, if the person in charge of covers knows what they're doing, allow you to test assumptions about what does and doesn't attract readers. This, unfortunately, tends to get taken to the wrong extreme. Once someone finds something that ticks (Abs in a cover line on Mens Health, for example [no, I'm not kidding]), the magazine tends to repeat that over and over until it exhausts. The smart editor tests and probes with covers, and the percentage sell through tells them a lot. "So it's not as simple as you might think. "And since my name was used in a hypothetical question, I'll take it out of hypothetical. Yes, a magazine could certainly treat Nikon as thoroughly as I do. Indeed, we have some close at hand examples of why I say that: look no further than Photoshop User and the empire Scott Kelby made from and around that. With the right people making the right decisions, it could be done for any niche, including Nikon users." Mike replies: Thanks Thom. It's true that I know very little about the business mechanics of putting out "millions a month." 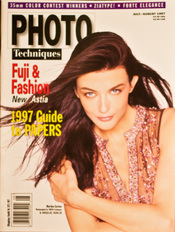 When I was in the category, though, no photography title was circulating in the millions. I think the best title was >500k, a couple were in the vicinity of 200k, and several strong ones were around 100k. We never made it as high as 50k. (Camera & Darkroom—the American one owned by Larry Flynt—had 16k subscribers when it went kerplooie.) I can tell you that none of our advertisers cared a whit for how much people were paying for the magazine! At least not that I knew of, and I was in all the meetings. In fact what they seemed to care most about was how many of those little reader service card requests they got, and that was already irrelevant even in my day. OTOH, our regular subscription rate was $20 for six issues, so maybe that counted in our favor, somehow. I do have a few funny stories about cover testing. One I've told many times in talks and probably here too, so I apologize in advance to anyone who might have heard me tell it before. At one point the company hired a very well-paid "cover consultant" to help us at the newsstand. His services consisted of calling me once a month to bend my ear for 45 minutes with the same wisdom he'd imparted to me the month before, and providing a critique of every cover we actually put out. After several issues' worth of rather tepid reviews from this fellow, I did a cover that pretty much went against everything he was telling me. (I do have a bit of a passive-aggressive streak, I'll admit.) It was a subject that no one would think was pretty—it was a picture by John Barnier of a cow skull, shot from the underside so that it looked vaguely like a face with eyes, to illustrate an article about the great English alt-process expert Michael Ware. There was only one color on the cover, and it was mainly dark; and the main blurb ran in the middle of the page. It said "The New Cyanotype" in a horrid faux-Goth face that still makes me chuckle under my breath when I look at it. As you might imagine, the cover consultant went ballistic. He wrote a scathing, two-page letter to the publisher saying every nasty thing he could think of about my Cyanotype cover and calling me every sort of name. I think he even suggested I be fired! The consultant loved it. Praised it to the heavens, and closed by allowing as how there might be hope for me yet! Well, you can probably guess the upshot. (Or else why would I be telling this story at all?) When the numbers came in, my cyanotype cover out-pulled the windblown-model cover on the newsstand. Pretty simple, actually: it appealed more to the darkroom workers who were the magazine's main audience. Our pretty model couldn't compete with the hundreds of prettier models on all the fashion, lifestyle, and womens' magazines; I'm quite sure it got lost in the store racks (and if it didn't, probably looked a little threadbare by comparison). But a darkroom guy would see that cool cow skull and go, oh boy, cyanotypes. Oh, and Thom, if you ever want to make some real money without working too hard, you really should consider hiring yourself out as a cover consultant. I'm still amazed at how much that guy charged us! It being the end of the month again, I'd just like to take a second to thank all of the people who bought something from Amazon, B&H, or Adorama through our links this past month. It keeps me chugging happily along, and, well, YOU DA MAN. Or woman. Just so you know, at Amazon we get credit both for the value of the things our readers buy but also for the number of things you buy. So yes, those people who bought Canon 1D Mk. III's are stout menschen in our Buch, but even if you purchase just a single DVD, or a small paperback, or a $10, $5, or even $2 gadget, widget, thingy or gewgaw, it still helps—probably more than you realize. And don't feel obliged. You're always welcome to visit and read and comment whether you ever help sustain us or not. 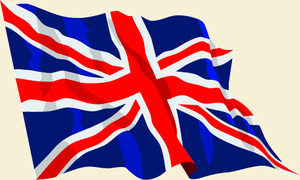 I'm wondering if readers in England, Scotland, and even Wales (perhaps even Ireland?) might chime in here with a bit of feedback. My friend Ailsa McWhinnie (former Chief Editor of Black & White Photography magazine) and I are considering a brief U.K. lecture tour, tentatively scheduled for the Fall of '09, and we're trying to get an early indication of whether there's sufficient interest out there to support such a thing. We're thinking of perhaps two evenings in London and perhaps four or five more between there and Edinburgh, and our early thinking is that we'd need at least 20 people in attendance at all six or seven lectures to make it all work. If it all comes together we'll be advertising it here and in B&WP. It would likely be more dear than better entertainment, just because of the specialized nature of such a thing, but we'll do our best to keep the price reasonable. I'm happy to do it for the cost of transportation and lodging, and Ailsa is similarly casual about recompense, but we don't want to be out of pocket. I'm thinking at this point about giving two lectures each evening, one about the Art of Photography and the other about cameras, and you could buy a ticket for one or the other, or both. Permission of the venues permitting, perhaps we could follow the lectures with a bit of wine and cheese and some more casual mingling. Quite frankly we're also open to ideas as to what people might enjoy. We'd hope to sell some tickets in advance (next Spring and Summer) at a discount. In addition, I'd like us to do some portfolio reviews. Between us, Ailsa and I have lots of experience in picture editing, and have dealt for years with many kinds of art photographers and professionals, and we feel we could give people some meaningful advice and feedback about their work. These would probably happen during the daytime, and, because these would be individualized and more time consuming, an additional fee for it would be unavoidable. How about it? Without having to commit, do you imagine you might have any interest in any of this? Please don't leave comments here. If this is something you might like to see happen, please write and indicate your level of enthusiasm to Ailsa at "info at squarepictures dotnet." Thanks! For now, I'll be hoping to meet some of you in person in 2009. It's sad that attempts to make material available, like the Southworth and Hawes daguerreotypes from GEH in the previous post, are likely to contribute to the devaluing of photography. One of the things that is immediately apparent if you look at daguerreotypes is that they are fascinating physical objects. And in particular they are very hard to reproduce: a digital image of a daguerreotype seriously fails to do it justice. This is true to a greater or lesser extent of many kinds of photographs. I went to an exhibition of inter-war modernist photography the other day ("Foto," currently in Edinburgh: see it if you can). I have a number of books containing good reproductions of works from the same era, but they don't compare at all well to seeing the physical objects, particularly the collages (photomontages?) but also the more conventional prints. As more and more material becomes available in digital reproductions, I think there is a significant danger that we will all start to think that this is what photographs look like, when in fact these things are quite often pale imitations (literally in some cases) of the actual physical artifact. Pictures of things are not the same as the things themselves, even when the things themselves are pictures. Featured Comment by Oren Grad: "In some of the most satisfying photo books, the photographer has not even tried to reproduce literally the attributes of the 'original' photographic print, but rather has created a new rendition that reflects the craft attributes of the chosen book-printing method. "The example that comes immediately to mind is A Hudson Landscape by William Clift. The tritones in the book by that name bear no resemblance to the silver-gelatin contact prints and enlargements Clift has made from the same negatives. The book and the prints remind the viewer of each other, but each stands on its own as a work of exquisite craft. They just happen to share the same source material, the original negatives. "Actually, there are three different expressions of this work, since the book has also been sold in a limited edition with an accompanying gravure created by Jon Goodman. "Following up on Mike's comment, the same applies to jpgs on screen. I prefer to think of web display as a medium in its own right, because the brilliant backlit display of a monitor is radically different from the relatively subdued reflective surface of a print, and the post-processing required to bring out the best in each medium is correspondingly different. Some pictures work well in one medium and not in the other; others can be effective in both, but in different ways. The print and the on-screen jpg are different works that happen to be derived from the same source." The George Eastman House has just uploaded several new sets on to flickr. Portrait photographers will be interested in the excellent and extensive selection of Southworth & Hawes daguerreotypes, long considered among the early masterpieces of photographic portraiture. 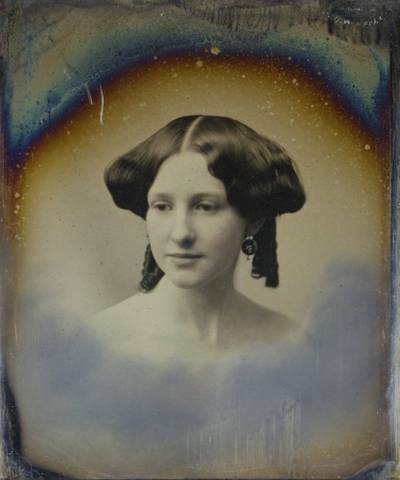 Featured Comment by Geoff Wittig: "The Eastman House Southworth & Hawes show was a landmark exhibition; there were literally hundreds of images, from delicate tiny locket photos to spectacular 'whole plate' Daguerreotypes of unbelievable quality. They are essentially a first generation contact image, with great detail rendition in larger examples. 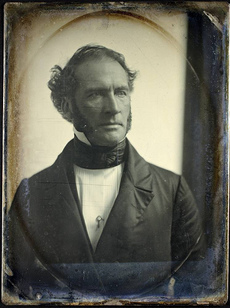 As others have noted, Daguerreotypes are impossible to reproduce accurately; they are subtle metal-on-metal images with an almost holographic quality, and the appearance changes with the lighting and the viewer's position. I went back to see the exhibition in Rochester repeatedly, just to get a sense in my head of what the images really looked like. 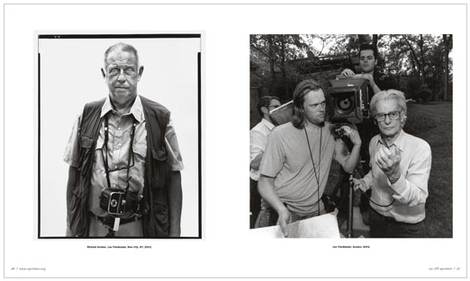 "Southworth & Hawes were sort of like the Yousef Karsh or Annie Leibovitz of their day. Celebrities and politicians from far and wide beat a path to their door for an official portrait. Some of the preachers genuinely look and pose like rock stars. The portraits of icons like Ralph Waldo Emerson are remarkably contemporary. 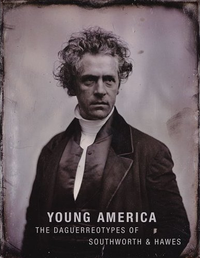 "The exhibition's catalogue (Young America: The Daguerreotypes of Southworth and Hawes ) is a remarkable effort to reproduce the images. Printed on very glossy stock, it comes as close as you can get to imitating the Daguerreotype effect. It's still available from Amazon, heavily discounted from the original $120 price. "Many Daguerreotypes were indeed hand-colored after development for a specific artistic effect. The subtleties of the 'plain' images are wonderful, but obviously there was a market for such colorized versions. They have a lot in common pictorially with other crude attempts at colorizing monochrome images." From Karsh snatching the cigar out of Churchill's mouth to Jill Greenberg taking candy from babies, provocation has played a long and not very noble role in photography. No one disputes how effective it can be—witness Avedon's photo of the Duke and Duchess of Windsor the moment he told them his dog had been killed—but ultimately isn't it a pretty cheap trick? Don't we photographers suffer a bad enough rep as is? Try though as you might to be a fly on the wall, sometimes you can't help but upset a subject. 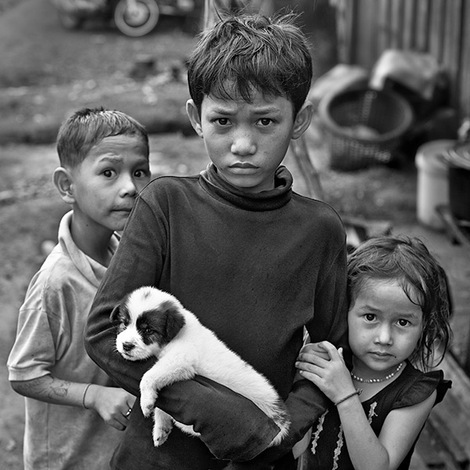 That's how it happened one day last month in rural Cambodia when three children ran up to me with their puppy. He was sick, they said. Could I do something? Please? There are no vets in places like this, and a westerner operating some high-tech photo gear probably looked more competent to help than anyone else around. But I had to be honest with them. "No," I said, in my broken Khmer, "I can't help." Then, reflexively, I raised my camera to capture the reaction. Well, an Avedon I'm not. I got the shot but the kids just stood there looking heartbroken. I swear, even the pup had a tear in its eye. So I did something I almost never do. I pulled out a couple of small bills and handed them over, muttering something about buying milk for the dog. That would have been the end of it, had I not happened by the same place the next day. There they were, kids and puppy, playing as happily and healthily as kids and puppies ever played. Even before they saw me and started laughing, I realized that…well, let's say I have a new respect for the curative powers of milk. And from now on, I'm provoking any child any time I like. I know that the deal here is that I'm supposed to tell you things I know, but occasionally I need advice on something you might know about but I don't. This coming Fall I'm tasked with making a video, but the extent of my knowledge of moving images is that I watch them on TV and in theaters. Assume a howling wind of blistering ignorance and you're right there with me. The video will reconstitute a seminar and will basically portray a talking head—although it needs to be watchable, too, so I need to be able to enliven it with some halfway competent effects. Nothing terribly fancy. It needs to end up looking halfway decent on a computer screen or typical CRT TV set. Can anybody help? I'm starting from zero and need to know about cameras, editing programs, and instruction books or online tutorials. Know any good websites? Books? Do I need to take a class? Any clue what kind of cameras are decent? Should I just try to hire a student or somebody and not try to do it myself? I should probably add that I work in the Mac environment. Got any expert advice or opinions? Clichés are sometimes true. Here’s one—photographers don't like to give speeches. At a recent event, photographer Antonin Kratochvil screened slideshows of his work: American soldiers coolly observing the Iraqi distressed and dead; Lebanese militant youths standing restlessly near decaying walls; American evangelicals speaking in tongues. The photographer then clambered onstage, ruddy and scarf-wrapped ("The Bedoins wear them!") for his talk, but he was no Christopher Hitchens. He hated talking about himself—as uncomfortable in the role of sage as the rest of us would be in a war zone—and he left the stage with half the time for his "speech" unused, encouraging his audience to spend it smoking cigarettes instead. Kratochvil is not alone in his taciturnity. When I recently asked one of the greats of the form for his thoughts, he e-mailed the aphorism: "To live happy, live hidden...."
Featured Comment by Geoff Wittig: "It's a depressing reality out there. The slow-motion demise of intelligently edited print journalism is all around us. In its place is a growing 'non-system' of on-line narrow-casting directed at increasingly isolated 'market segments.' Right-wing blogs that only discuss how the 'surge' has succeeded, progressive blogs all about Bush/Cheney's latest outrage, and never the twain shall meet. Okay, many of the mainstream news stories published in Time or LIFE in those halcyon days of W. Eugene Smith were hackneyed or neutered, but at least there was an attempt to enlighten via narrative. Unless you take the trouble to read European publications or seek out fringe journals like Doubletruck, mainstream newsmagazines are increasingly a wasteland." For those of you who might be looking for Edward Taylor's review of the Sigma DP1, I've just added it to the "Camera Reviews" page, and here's a direct link. David Pogue has a video review of the Sigma DP1 on the New York Times home page today that is excellent. (It augments his written review.) Finally, someone explaining the benefits of a large sensor in a small camera from a significant podium in the MSM—on the premier web page of the nation's best newspaper, no less. That ought to get some visibility for the cause. D.P. pretty much nails the Sigma accurately in both ways—pro and con—but what's got me stoked is that he explains so well, and from such a visible soapbox, why so many of us want large-sensor digicams. The video is entertainingly done and, I would think, clear enough for pretty much anyone to understand. Hopefully it will begin to drive widespread awareness of the sensor-size issue among shoppers in general. A big, heartfelt well done from here! In one of the comments under his "Payola" post, Ctein said, "Plus, most reviewers try to avoid reviewing obvious dogs, because it's just not fun...." He's 100% right, and his comment reminded me of an assignment I got back in 2003 (from a big media empire) to review what turned out to be by far the worst non-toy camera I've ever seen. Saddled with this hunk o' junk, I thought I'd try to salvage a wee bit of fun—at least for me, and, I faintly hoped, a reader or two—by flipping the logic of the review. Alas, my heartless editor spiked the piece. I offer it hereby both to stick my tongue out at said heartless editor (are you reading, A?) and as an example of one bored reviewer's response to the obvious dog dilemma (Ctein's Conundrum?). —E.H. At first we thought Polaroid's bare-bones 2-megapixel iON 230 was made by drunken clowns, but then we realized that—of course!—it's a deliberately ironic commentary on the quest for perfection. Connoisseurs of crud, this is your Mona Lisa. Our initial confusion was probably due to the fact that, from a distance, the iON 230's slim shape looks appealing, and it's brushed aluminum body is very light at 3.9 ounces with battery and media installed. Approaching the camera a little closer, however, we found impressively shoddy build quality with nary a single evenly joined seam and, in a daring innovation, front and rear surfaces that are actually warped. The inadequately labeled, generally mushy controls and the weirdly cryptic menu system are, frankly, predictable. But in an inspired touch, the strap lug on our sample camera was so badly made we couldn't thread the strap through it. Genius! Despite this great start, Polaroid was able to do little worse than average with the iON 230's very basic snapshot feature set. Both white balance and exposure are fully automatic only, but there is an exposure compensation function (to plus or minus 3EV) buried in the menus. The 48mm lens (the 35mm film equivalent) offers no wide-angle capability, but that hackneyed move gets no credit from us. The lens has two focus positions (normal and macro), which you select with a slide switch on the camera's left side. You can choose one of three resolutions for your JPEG still images, which are saved on an SD/MMC card, and you can record 320 x 240 silent video clips up to sixty seconds long. With the included cradle, you can also use the iON 230 as a webcam. 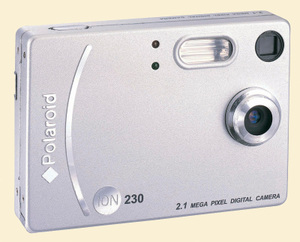 If the average feature set is a puzzling misstep, Polaroid regains its footing with the iON 230's miserable performance. Startup and shot-to-shot times are about seven and five seconds respectively, and shutter delay is an agonizing 1.5 to two seconds, a remarkable achievement for a non-autofocus camera. Switching modes and accessing the menus is delightfully painful. The 1.5-inch LCD is unfortunately not that bad, offering an acceptably sharp image, but maximum flash range is a short six feet. We got 210 shots from a single charge of the camera's proprietary lithium battery. Truly crummy images are, of course, the necessary finishing touch on this kind of work, and Polaroid delivers. Although noise is relatively low, our test pictures are blocky and harsh with blown out highlights, sickly colors, and occassional strange color shifts across the frame. The obligatory blurriness, however, looked to us like merely an afterthought. As a further comment to Ctein's "Payola," below, another fact of life in product reviewing is that it's virtually impossible for any magazine or website to establish and maintain the same relationship with all companies equally. That's true when some of the companies advertise with you and some don't, but it's also true even in the absence of the advertising influence. Even the biggest publications have some sort of natural bias; their staff has certain interests, and uses and likes certain types of products. Naturally, they'll tend to attract a readership that is also interested in those things. Then, to get to that same readership, the companies that make appropriate products gravitate toward that publication. 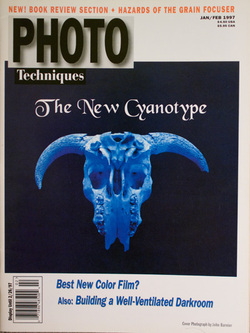 For many years, for example, Photo Techniques was edited by one practicing sensitometrist (David Alan Jay) and had another as a Contributing Editor (and de facto technical editor, although he never held that title)—Phil Davis, author of Beyond the Zone System . Phil wrote many articles centering around sensitometry, and David was supportive of that type of content. 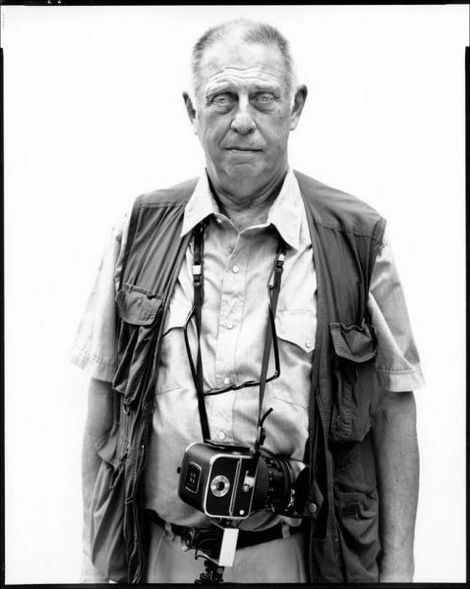 In fact, when I took over from David Alan Jay, he said to me that to "fully participate" in his magazine, a reader needed to own three things: a sheet-film camera, a spotmeter, and a densitometer. It just happens that some companies will like and support certain publications, and vice-versa, and a relationship builds. Certain relationships grow and flourish while others wither and go moribund. As time goes on, that process tends to reinforce itself. Remember that many companies have very small advertising budgets. They might be able to place their ads in only a handful of publications, or only two, or just one. They strategize very carefully to try to figure out where an ad placement will do them the most good. Certainly, X-Rite wasn't going to try to have its latest densitometer reviewed in Petersen's Photographic, and Kodak wasn't going to advertise disposables with us. After some years have gone past, you find you've known certain business associates for a long time. They might even become friends. Sometimes advertising is indeed a part of that mix; sometimes it isn't. The relationships tend to ebb and flow anyway. That seems both natural and unavoidable. Featured Comment by John Camp: "This topic, perhaps cast in somewhat wider terms, is one that whole journalism courses are devoted to, and it's not an easy one. The most recent really big blow-up on the camera-oriented 'net, as far as I know, was Michael Reichmann's predicament with his review of the Leica M8 on his Luminous Landscape. "A lot of people have reflexive reactions to this kind of thing (usually, publish and damn the consequences), but the longer you think about it, the more troubling the consequences become. In my view, Reichmann was more-or-less screwed the moment the Leica turned up in the mail. At that point, something bad was going to happen no matter what he did. "Interestingly enough, though, he then published a column which recounted his reactions to the M8, and his decision not to refer to certain problems with the camera. That's when the stuff hit the fan—but that's exactly at the point in which I decided that he was more trustworthy than I otherwise might have expected. He could have kept his mouth shut, and no one would have been the wiser; instead, he admitted what he'd done, and explained why. "This whole issue is a bottomless bucket. IMHO, there is no 'answer' to the problems created; it's something that has to be dealt with on a case-by-case basis. In the Reichmann case, I believe I might have done the same thing he did, right down the line. I just wonder if I'd have had the balls to admit it later." Featured Comment by Ken Sky: "Start with the premise that no one can be totally without bias. An honest reviewer lays out his/her bias at the beginning of the review. The review should provide as much objective information as possible (data) and when the reviewer draws conclusions all caveats should be pointed out as well as the criteria for these conclusions. Unfortunately, we as consumers/audience are also part of the distortion. How many of us can honestly say that we have read the article the first (only) time from beginning to end before skipping to the conclusions? If we do the latter we become biased as to how we absorb the data. That's what leads to all the fighting on internet fora." Mike responds: Ken Sky raises a point that's vivid to writers but seldom acknowledged on the internet: readers often read poorly, incompletely, or with their whatever-colored glasses on. Sometimes they reach closure early, occasionally way too early. I'm aware of one phenomenon I call the "imported argument": it's when we raise the specter of an issue that a commenter has long been arguing on another forum, and he brings to our article all the arguments he'd developed on that other forum—sometimes without bothering to comprehend the subtleties of the argument being made here. I'm good at recognizing this. Then, just as surely, we all tend to read for affirmation: a person who badly wants to think that a camera is great, for example, might gloss over or miss the negative points stated right there in black and white under his nose. But of course the most common error is simply quick scanning and sloppy reading. I'll often receive questions that were explicitly answered within the article. Just as listening is a skill that requires intelligence and attentiveness and that can be mastered, so is reading. Of course, good and bad readers might be the same person—each of us—in different situations or on different days. Habitual careful reading is relatively rare, I would guess. The big news is so far that Panasonic has declined to increase the pixel count, which in its press release it calls a "bold" move. Maybe from the point of view of marketing it's bold to pull up in the megapixel race, but to us it just makes good sense. The $500 camera is also available in silver and will ship in August. Featured Comment by Erlik: "'...the fastest, widest lens yet on a small-sensor camera.' Pedant alert. :-) Widest, no. Fastest, no. Widest (AFAIK) was the Kodak V705 with 23mm. You know, the weird one, with a 23mm prime and a 39–117mm zoom. Fastest, I'd say it was Olympus C-5050, with its ƒ/1.8–2.6 lens. An excellent lens, by the way. 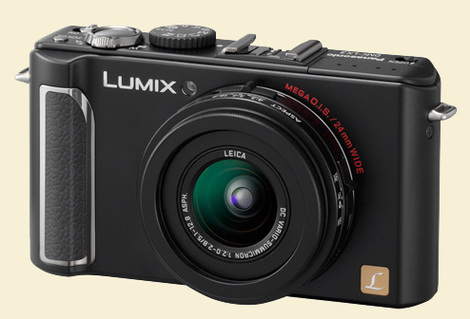 But all together, this Panasonic looks like quite an interesting compact camera. Featured Comment by Gordon Lewis: "I think I'd rather wait for the more expensive Leica version. The specs and the lens—designed by Leica, by the way—may be exactly the same, but it's still not a 'real' Leica unless it says so on the body. (He laughs mischievously, then clicks the Post button.)" Featured Comment by Switters: "I'm actually pretty excited about the LX3. The specs are great, yes, but the thing has style! I'm remembering Mike's recent post exhorting people to 'find the equipment they love' regardless of whether it makes perfect sense on paper. For me the aesthetics and the 'feel' of a camera is important to me. This one looks like a winner from that perspective." Featured Comment by Jeff M: "I've been fooled twice before by these little beauties, but they ain't gonna get me a third time. Both the 1 and the 2 were gorgeous in the all black version, and the specs were fabulous (at the time, of course). They have real Leica lenses and very enticing native panorama modes. Yes, well...they are also both so noisy, even at 200 ISO (some would say 100 ISO), that I stopped using them after noticing I had stopped printing images from them. I can forgive myself for ignoring the reviews the first time, but I have no excuse for #2, so you guys go for #3 and I'm gonna sit back this time, no matter how pretty it is." Featured Comment by John Mitchell: "Another Random Excellence: Avedon by Friedlander, made on the same occasion. 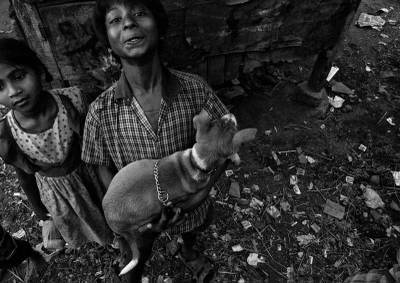 See Jeffrey Fraenkel's article "One Day in May," Aperture magazine No. 188, Fall 2007." Many people like where they live and most people are proud when their locality gets wider recognition, something that happens rarely enough in my humble little 'Sconsin burg. 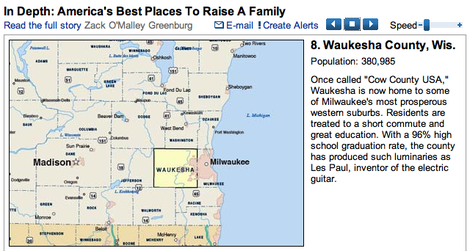 So I have to brag—Waukesha placed eighth, no less, on Forbes.com's list of America's Best Places to Raise a Family. I'm counting that as Something I Did Right, because that's why I'm here—being a single parent of a single child, I needed a place that would be good for my son. Forbes somehow failed to note that Waukesha is the home of T.O.P. World Headquarters, but hey, at least they mentioned Les Paul. Is photography the only gift you can give people where half the time they'll ask you for more? Give someone a print as a gift, and they might say something like, "Oh, this is wonderful, can you make one for Myrtle and Squatty too?" Or, "I just love this, can you make me another one, but bigger?" Or how about this: "Would you mind making me one that's exactly eight-by-ten so I don't have to get a custom frame for it?" Which is a perfectly reasonable request, I suppose. In fact, many times when I give prints away, I make them eight-and-a-quarter by ten-and-a-quarter with a little air at the edges, so they'll fit in storebought frames. Still, there's just something weird about giving photographs as gifts. I've never given someone a book for Christmas and had them say, "Thank you very much, now would you mind also buying one for my cousin Frank?"